Perhaps you’ve heard of Buster Brown. Created by Richard Felton Outeault for a comic strip in the “New York Herald” in the early 1900s, Buster was an upper class child with a blonde pageboy haircut. He wore a wide saucer-brimmed hat, short brown pants and a cropped Victorian jacket. New Yorkers enjoyed following Buster’s adventures, as he roamed the city always getting into some kind of tomfoolery. But I suspect you don’t know the story behind his faithful companion, Tige. Tige was a famous cartoon version of the American Pit Bull Terrier in his day. He was also one of the first dogs to anthropomorphically speak in a comic strip. Together, Buster Brown and Tige would run around and get in all sorts of trouble. When Buster signed up for the Boy Scouts, Tige became an honorary Dog Scout. 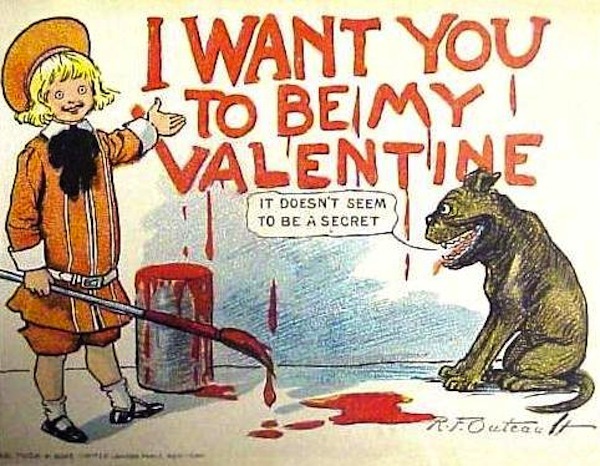 Buster Brown and Tige weren’t just funny little scallywags; their comic strip ventured into racy topics. According to a feature on National Public Radio, one story line was a social commentary about “race suicide”: Caucasians who used birth control would not be able to keep up with the increasing immigrant population of the early 1900s. 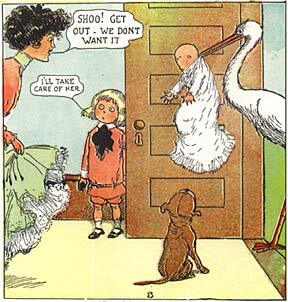 In another strip, Buster went to the zoo and asked a stork to give him a little sister. When she arrives on his doorstep in the beak of the bird, Buster’s mother says, “Shoo! Get out – we don’t want it.” Buster Brown replied, “Oh, I’ll take care of her.” Faithful Tige just sat there and watched, a pit bull with two young children to raise. By the early 1900s, silent movies featuring the pair delighted children of all ages. There were hoards of young boys sweeping the country, decked out like Buster Brown and clamoring to have a pit bull like Tige by their side. 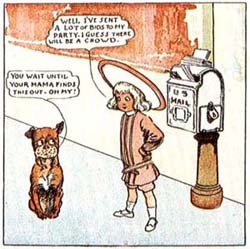 “Buster Brown and Tige puts a Balloon Vender Out of Business [sic]” is one of their silent films, a slapstick comedy featuring smaller pit bull type dogs jumping up and popping the vendor’s balloons. In subsequent films, Buster Brown found himself in even more jams where faithful Tige had to come to the rescue. “Buster’s Dog To The Rescue,” a YouTube video of a 1904 movie featuring the ragtime music of Scott Joplin, shows Tige rushing into the room to save Buster Brown when the boy receives a spanking after he tried to steal some cookies that were placed high on a shelf. William “Major” Ray, who travelled with the Sells Brothers Circus before settling in Missouri to open a general store, portrayed the most prominent version of the Buster Brown character. He was only 44 inches tall and convinced Outcault that he would make a better version of the comic strip child than an actual child. Outcault bought into it, and Ray and his pit bull type dog reached celebrity status. In 1904, Outcault sold licenses of the characters at the “Meet Me In St. Louis” World’s Fair. The Brown Shoe company purchased the Buster Brown name and took a series of actors on the road, dressed as the characters. Of course, Tige came along for the ride. Buster and Tige made debuts in theaters, and department and shoe stores, as entire towns gathered to see the performances. Pit bull type dogs toured the country delighting audiences for 26 years. Before long, Smilin’ Ed McConnell and the Buster Brown Gang debuted on a West Coast NBC radio network. By 1951, Smilin’ Ed – and Tige too – moved to television, where their show ran until 1954. This means that for decades, pit bulls had graced every form of media in a positive light. In 1999, the Brown Shoe company created a children’s brand called Buster Brown & Co. The branding featured none other than Tige, the pit bull. In the end, Tige and his best friend, Buster Brown, made history. The scallywag companions became celebrities on all major fronts: from the “Meet Me In St. Louis” World’s Fair to the silver screen and troops of performances in between. Youth clamored to have a dog like Tige by their side. Tige was America’s dog of yesteryear, and today his legacy lives on in American-made shoes, as well as nostalgia of times long forgotten. This article was originally published on November 15, 2011.